Don't believe the doomsday hype about the putative Planet Nine. Yesterday (April 7), the New York Post published a video claiming that Planet Nine — a hypothesized world in the solar system's far outer reaches — could send asteroids and comets hurtling into Earth soon, with potentially devastating consequences. There is so much wrong here. First of all, the Post's tweet, and the new 30-second video, describe Planet Nine as an officially discovered and confirmed world. This is not the case; astronomers Konstantin Batygin and Mike Brown, both of whom are based at the California Institute of Technology in Pasadena, inferred the planet's existence based on the strange orbits of a half dozen small objects in the Kuiper Belt, the ring of icy bodies beyond Neptune. 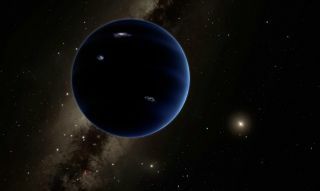 Astronomers are now actively hunting for Planet Nine — which Batygin and Brown think is about 10 times more massive than Earth, and orbits about 600 times farther from the sun than our planet does — but to date, it has not been detected. Second, we have nothing to fear from Planet Nine, even if it does exist, according to Brown. The New York Post's misleading video may result from a conflation of Planet Nine with other hypothesized, undiscovered objects in Earth's neck of the cosmic woods — namely, Nibiru and Nemesis. Nemesis is a small star or brown dwarf (a "failed star" that's considerably larger than a planet) hypothesized to zoom through space not far from the sun. Nemesis' gravitational pull regularly jostles the faraway comet repository known as the Oort Cloud, the idea goes, sending comets barreling toward Earth — and thus explaining the perceived cycle of mass extinctions on our planet, which seem to occur every 26 million years or so. The Nemesis hypothesis is more scientifically respectable than the Nibiru fairy tale. Again, however, astronomers have found no solid evidence that the supposed star/brown dwarf actually exists. The New York Post wouldn't be the first outlet to lump Planet Nine in with Planet X, Nibiru and Nemesis. On Wednesday (April 6), Brown, motivated by what he read in a different Planet Nine news story, offered the following helpful hint via Twitter: "PSA: Planet Nine is not Planet X or Nibiru or Nemesis. All theories of 'a planet out there' are not the same theory!" In other Planet Nine news: A new modeling study suggests that, if the putative world actually exists, it's likely about 3.7 times wider than Earth and is downright frosty, with a temperature of about minus 375 degrees Fahrenheit (minus 226 degrees Celsius).